He also had an amazing fight with Big Nog in Pride. He soon started to lose fights though. Often by injury. 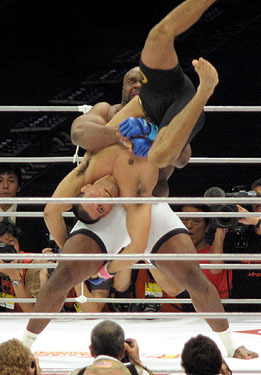 Basically, Bob Sapp had suddenly decided that he didn’t want to train anymore, or be involved in battles in the ring, so he just turned up, pretended to but hurt and/or injured, and started losing all his fights. His MMA record soon went from 11 wins 6 losses, to 11 wins and 18 losses. Bob put money before any pride or honour, and just started accepted what he saw as an appearance fee, rather than a fight purse. He’s made a lot of money doing this, avoiding real injuries no doubt, but degraded the sport in the process. Don’t get me wrong, I understand the need to cash in on everything, it’s something that we all have to do at some point no doubt, but it still annoys me. I mean, what kind of a d!ckhead, pays £50 for an Affiliction T-shirt? You have to be masking some kind of insecurity, or have way too much money to be paying that price for a T-shirt. If that wasn’t bad enough, take a look at the price of the latest England football shirt – £86! Are you less of a fan if you don’t pay that for a T-shirt? Are you less of a Dad if you don’t buy it for your kids? KPIs (Key Performance Indicators) are often full of ‘loopholes’ and I think they are relied upon too much. They are used as a way to communicate performance from the ‘front line’ to more senior members of staff. But KPIs, in my opinion, caused the credit crunch. For example, if you’re working in a call centre and monitored on calls per hour? If you are working for a mortgage lender and monitored on sales? Don’t worry if people can actually afford their mortgages, just sell it to them. You won’t be good at your job if you worry about things like that. It’s ridiculous, but people still love using them. Even doctors/GPs, nurses and the rest of the medical and pharmaceutical industry are given KPIs. Would it be easier to monitor people more subjectively? For example, could a call-centre manager not just get off his/her seat and actually make sure everyone was working, and listen to the calls perhaps, to make sure they are trying to do everything correctly? Why can’t we report qualitatively, as well as quantitatively? And how can people who don’t do the job, know what a fair target is? Martial arts is now a business for many. Which is a good in many ways, as we now have better facilities and more opportunity to train. It will be very sad if certain demographics ever get priced out of it though – if they can’t afford the monthly membership fees. I hope we never see chains of MMA gyms either – with the dreaded sales KPIs that we see in some chains of fitness gyms. 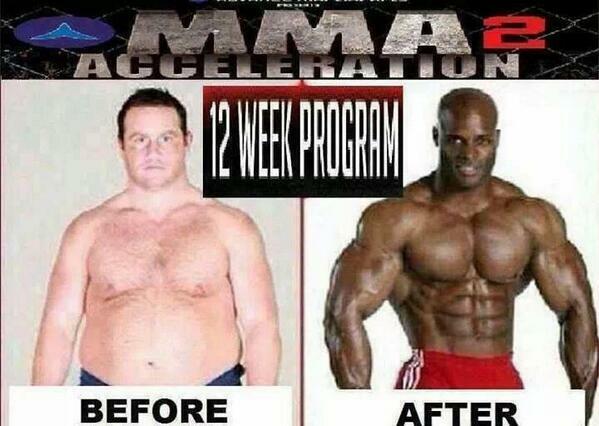 The bodybuilding-supplement marketing has to be the worst. I remember seeing an advert in FLEX magazine for creatine endorsed by Jean Pierre Fux; I was confused when I finished the bottle and I was still only 12.5 stone. To be fair, you can actually buy ‘designer steroids’/prohormones online, or in many a high-street store; which are pretty much the same thing as steroids like those sold under the counter in bodybuilding gym. 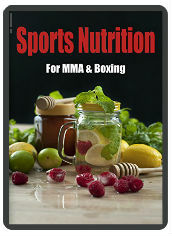 But most supplements are not, they are just tablets with a few herbs in. Which won’t potentially kill you like steroids can, but won’t make your muscle big either. I’m not an angry revolutionist or anything, I just wish money didn’t influence every sphere/aspect of my life and corrupt the soul out of it.